Commercial fishing remains the deadliest job in America, according to data released by the Department of Labor today. New statistics about on-the-job deaths in 2011 show that fishermen continue to have a higher chance of dying while working compared with those in other occupations. Their fatality rate per 100,000 full-time-equivalent workers was 34.6 times the average rate for U.S. workers in 2011. Fishing is inherently dangerous but it’s still important to look at the several ways to make it safer. Inspections, the use of safety gear and training all make a difference. So can the way fishing regulations attempt to address overfishing. 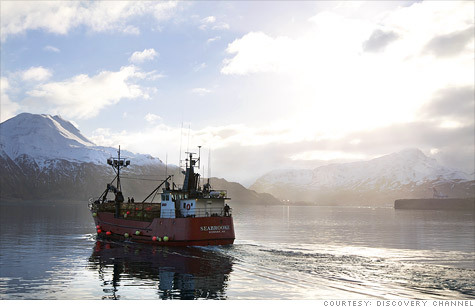 Scott Campbell Jr, a captain on Discovery’s “Deadliest Catch,” one of cable’s most popular shows, told CNNMONEY that catch shares have brought significant safety, environmental and financial benefits for crab fishermen in Alaska’s Bering Sea. While crabbing in the Bering Sea is inherently dangerous, catch shares have made it less deadly. Before crabbers were racing in an intense derby as short as two days, and 8 crabbers perished during the last five years of traditional management compared to one since the switch to catch shares in 2005. According to CNNMONEY, Campbell explained that prices have improved. In addition, with longer seasons, crab pots can “soak” in the water longer, which gives the small crabs more time to escape, as intended. For those that don’t escape, fishermen have more time to sort through crabs they catch and carefully return the small ones you’re not allowed to catch back to the water unharmed. 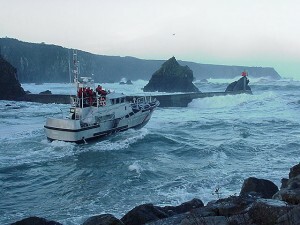 Under conventional fishery management, fishermen often have no choice but to go out in rough seas. Under catch share management, fishermen have the flexibility to wait and fish in good weather and safer waters. Today the Bureau of Labor Statistics announced that in 2009 commercial fishing once again had the highest fatality rate per 100,000 full-time equivalent workers. The rate was approximately 60 times the average fatality rate for all workers, and was higher than for loggers, police and sheriff’s patrol officers, as well as aircraft pilots and flight engineers. Why is it so dangerous? To a certain degree, fishing is inherently dangerous – going out on a boat in the middle of the ocean, hauling heavy swinging pots or nets onto a deck covered in gear while waves crash around you carries a certain amount of risk. But the job can be made more dangerous due to restrictive fishery management policies that try to limit fishermen’s catch by severely limiting fishing seasons and/or days-at-sea. When faced with such restrictions, fishermen attempt to maximize their catch in these short windows of time by going out regardless of weather, working longer shifts and overloading their boats with equipment. Keith “Buddy” Guindon from Galveston, Texas had one of the scariest moments of his career as a lifelong commercial fisherman when the Gulf’s commercial red snapper fishery used to be limited to short seasons. He and his crew fished so long and hard that one night the lookout on duty fell asleep, leaving the boat to drive itself for 2 to 3 hours through the Gulf’s now infamous oil field. Surprisingly, the boat didn’t wreck — avoiding potentially fatal consequences. One way safety can be improved is with catch share management. Under catch shares, fishermen are required to stay within a specified cap for the season and in return have flexibility about over when to fish. The result is safer jobs. Five years after catch shares were implemented, ten U.S. and British Columbian commercial fisheries saw an average 2.5 fold increase in safety, as measured by lost vessels, search and rescue missions, injuries, deaths and safety violations. The number of search and rescue missions for Alaska’s halibut and sablefish fishermen declined after catch shares were implemented from 26 and 33 in 1993 and 1994 respectively (pre-catch shares) to just 5 cases in 2007 and 3 in 2008 (under catch shares). More than 85 percent Alaska halibut fishermen surveyed found fishing to be safer under catch shares. Many people think of Alaska crab as “The Deadliest Catch” after watching the popular Discovery Channel series filmed in the Bering Sea. The Alaskan crab fisheries were quite deadly: one vessel and five crewmen were lost on average each year in the 1990s. The fishery became safer due to both the implementation of a dockside safety monitoring program, and by switching to catch share management. 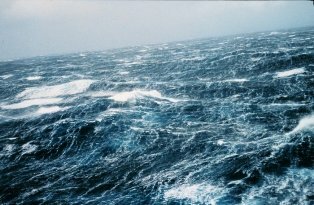 Ending the “race for fish” reduced the incentive for stacking too much gear on board (destabilizing vessels) and reduced pressure to fish in poor weather conditions. It also improved the economic stability of the industry, eliminating less seaworthy vessels and leading to the development of more professional crews, all of which contributed to improved safety. An article in Proceedings of the Marine Safety & Security Council, the Coast Guard Journal of Safety at Sea states, “an increased number of fishing days, increased flexibility for masters to choose when to fish, and reduced emphasis on catching power and large pot loads potentially have safety benefits and contribute to eliminating vessel losses.” Since coming under catch share management five years ago, there has been only one crabber in Alaska who has lost his life while fishing. The experience in Alaska illustrates how catch share programs can play an important role in improving safety. Catch shares reduce the pressure to fish in bad weather and dangerous conditions, as well as allow fishermen to work with more rest in between trips. Because catch share programs are more profitable, fishermen can also better afford to maintain their vessels. Buddy Guindon is glad that the Gulf’s commercial red snapper fishery is now a catch share. Proceedings of the Marine Safety & Security Council, the Coast Guard Journal of Safety at Sea, Spring 2009. 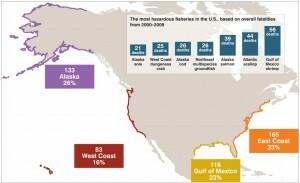 In Sunday’s Anchorage Daily News story: Deadliest Catch? Salmon, Not Crab, fisheries journalist Laine Welch writes about new statistics on where fishing fatalities are the worst. It turns out crab in the Bering Sea is not the deadliest catch. That fishery claimed the lives of 12 crabbers since 2000, while other fisheries saw many more deaths [Gulf of Mexico shrimp (55), Atlantic scallop (44) and Alaska salmon (39)]. Welch says the Bering Sea crabbers attribute the increased safety to the shift to catch share management in 2005. She explains that only one life has been lost since 2005, compared to 77 deaths between 1991 and 2005.